Russia said it was righting a historic wrong — Soviet leader Nikita Khrushchev had transferred Crimea to Ukrainian control in 1954 — and the move resulted in a major boost to Putin’s popularity. But the takeover was denounced by Kiev and the West as an annexation and, along with Moscow’s support for separatist forces in Ukraine’s east, has led to wide-ranging sanctions against Russia. 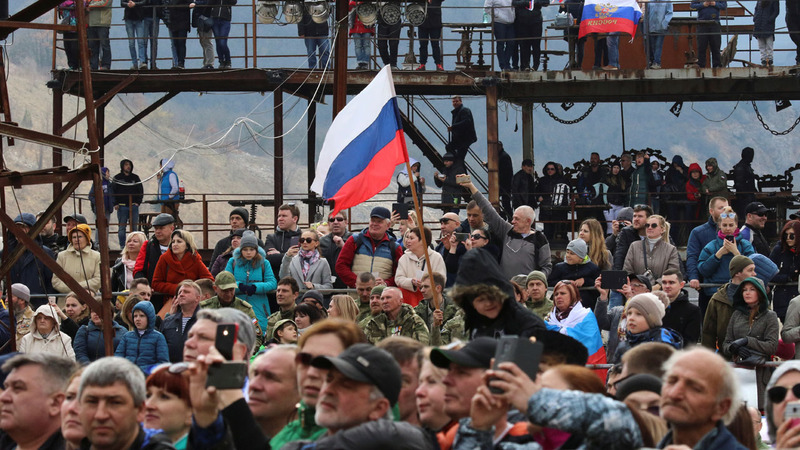 In Russia, March 18 has been officially proclaimed the “Day of Crimea’s Reunification with Russia” and celebrated with events across the country. City authorities in Moscow organised a street festival called “Crimean Spring” hosting jazz concerts, cooking workshops and a photography exhibition a stone’s throw from the Kremlin. Up to 10,000 people were expected to take part in a flash mob in the Moscow region on Monday, dancing to the Soviet-era song “Waltz of Sevastopol” — the Crimean city home to Russia’s Black Sea fleet. Pro-Kremlin media on Monday praised the 2014 events as “the restoration of historical justice” and said the peninsula is thriving under Russian rule. “There is growing understanding in the world that Crimea is part of Russia and will be forever,” Valentina Matviyenko, the speaker of Russia’s upper house of parliament, wrote in a column for newspaper Izvestia. Russia’s liberal press painted a more sombre picture on the anniversary, saying the takeover of the peninsula made Russians poorer and more isolated from the world. “For one part of Russia, the events around Crimea were a moral catastrophe,” liberal newspaper Novaya Gazeta said in an editorial. Five years later, the euphoria surrounding the Crimean events has worn off and “stopped being a source of political benefit” for authorities, it said. Ukrainian Foreign Minister Pavlo Klimkin told AFP ahead of the anniversary that Russia’s move had left Crimea in limbo. “Under Russian occupation Crimea is going nowhere, it has no future,” he said. Ukraine “feels pain for this every day”.